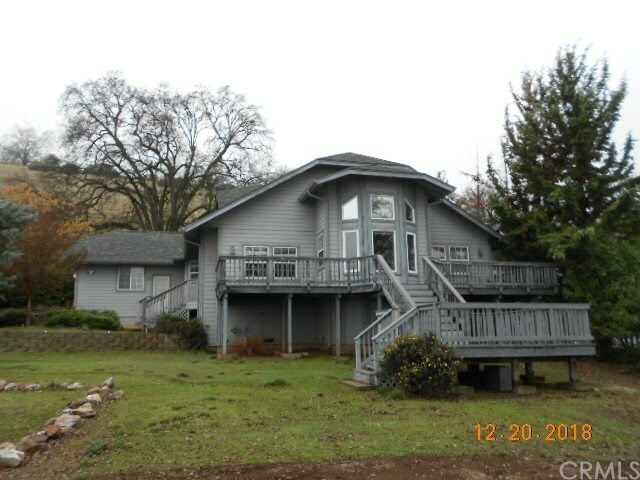 This lake view home is located in North Lakeport area; county records show home at 1968 sq ft and constructed in 2000 with 3 bedrooms 2 baths. Parcel size is shown at .79 acres. Formal entry leads to the dining area with sunken petite living room to the right; family room is just past the dining area with a corner fireplace; kitchen has tile counters and includes dishwasher, double oven, island with propane cook top and breakfast nook with door to front deck. Master bedroom has mirrored closet doors and large master bath with garden tub, separate shower and double sink vanity with tile top. Guest bath has shower with tile surround. Laundry room leads to the attached double garage with Beckett water heater. Large patio to the rear; front has deck with lake view. Forced air heat and Master Cool system.